Taking Stock In The Search For Aliens : 13.7: Cosmos And Culture We need to get past the "giggle factor" when thinking about life, including intelligent life, on other worlds — but if it's out there, the search will take time, says astrophysicist Adam Frank. 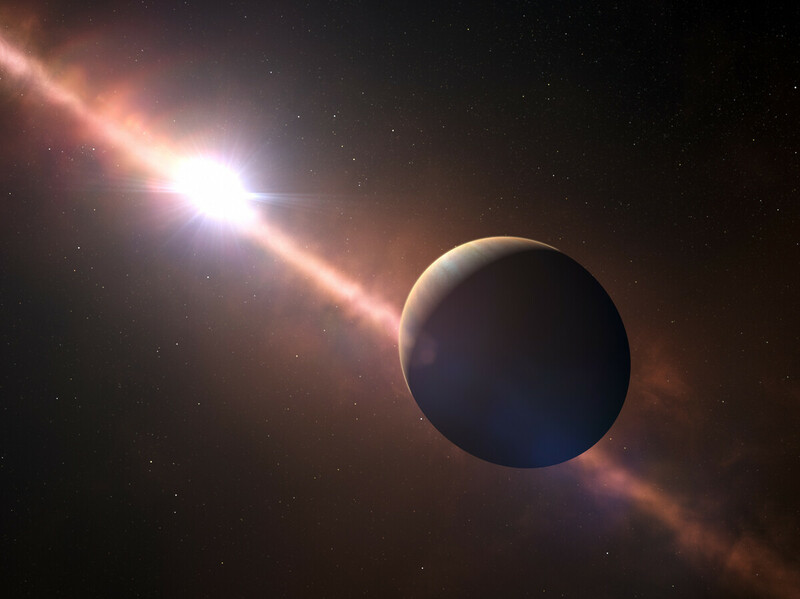 This artist's view shows an exoplanet orbiting the young star Beta Pictoris. The exoplanet has an eight-hour day — and a much faster rotation than any planet in the solar system. So last year was pretty strange, right? I know you know what I'm talking about. I'm talking about — aliens. I'm talking about other civilizations on other worlds. What I'm really referring to are some of the remarkable goings-on in SETI, humanity's Search for Extraterrestrial Intelligence. The last 18 months have made for a bumpy and exciting ride for those who are serious about the science of SETI. To help us understand what's going, I spoke with two experts. Jill Tarter holds the Bernard Oliver Chair at the SETI Institute. She is a pioneer in the field, having led the development of its science with precision, acuity and creativity. And, of course, one can't forget to mention that she was the inspiration for Jody Foster's character in the movie Contact. I also spoke with Jason Wright an associate professor of astronomy at Penn State. Wright represents the tip of the spear of a new generation of researchers who count SETI among their interests. So to begin our "Year in SETI" review, let's start with an amazing object known as the WTF star. That's short for "Where's The Flux." Astronomers found the WTF star by accident in their search for exoplanets using the Kepler space telescope (it was actually found via a Kepler-based citizen science project). Exoplanets are worlds orbiting distant stars. Until 20 years ago, no one knew if they even existed. An exoplanet will show itself in the Kepler data when it passes between its own sun and us. They make nice, regular dips in the star's brightness once every orbit. But the WTF star was anything but regular. It dimmed and brightened in ways no one had ever seen before. It was crazy weird — and it just got weirder. Looking at old astronomical photographs, it appeared that the WTF star was also gradually losing brightness in a way that was unprecedented. By studying more recent observations, astronomers were apparently able to confirm the star's slow fade. "It's really weird," says Jason Wright. "The fact that it has stayed weird despite a huge amount of attention by a lot of very smart astronomers has cemented this as an interesting puzzle worth solving." Jill Tarter agrees: "The WTF star is interesting. There's obviously nothing that we can see that tells us the data is not credible or this isn't a serious effort." Now, most likely, all this crazy weirdness has a natural explanation — something like comets passing between the star and us (or something else). One of Wright's contributions was to map out the different families of explanations for the WTF star. Among these possibilities were "non-natural" explanations, like huge machines orbiting the star. Work was even done to calculate the properties an orbiting artificial structure would be need to make the WTF star appear so abnormal. When the media caught wind of this, they — and the public — went bonkers. It made news everywhere. CNN headline's was typical: "Discovery of Strange Star Could Mean Alien Life." Maybe a story with the term "Alien Megastructures" even crossed your Facebook feed. Now, let's be clear. It's overwhelmingly probable that the WTF star is NOT (I repeat NOT) orbited by alien megastructures. Wright and others don't believe they're seeing alien megastructures. They were simply including it as one possibility in their big bag of possibilities. "It is an explanation of last resort," Tarter says. "Past history has gotten us accustomed to having natural phenomena turn out to explain anomalies." So, whatever causes its weirdness, the WTF star deserves attention. But there were two other SETI stories last year that didn't deserve attention and they tell us something important, too. First was a one-time radio pulse caught by a Russian telescope. Then there was a study claiming to see a few hundred stars with weird light pulses. In both cases, other scientists were quick to point out how shaky the claims were. "The Russian telescope was a wild signal just waiting to happen," Tarter says. According to Tarter, the Russians looked at a particular star 39 times and only once got an event that seemed interesting from the SETI perspective. It was essentially a one-time event. "One out of 39 is going to really down weigh the credibility," Tarter says. The other paper claiming hundreds of stars with unusual, and perhaps SETI-worthy, light pulses also fell flat with scientists like Tarter and Wright. "That paper went through more than one journal and took a long time before it got published," says Tarter, indicating her skepticism. But that didn't stop some in the media from jumping on the stories. Many major news outlets carried them and, while most pointed out the skepticism of other scientists, the fact that it made the news at all tells us something interesting: The discovery of the WTF star's weirdness, the two false alarms and most importantly, the public's reaction to it all shows that we may be entering a new era when it comes to thinking about intelligent life in the universe. "One of the things that really surprised me this year," Tarter says, "is how almost desperate the media is to have a detection. They're so eager. It's probably our fault, that is, the exoplanet community, because we keep saying Earth 2.0 is right around the corner. We keep talking about habitable zones and all this sort of thing without telling the story that it's going to be a very long time between here and there." Tarter is right. Because of Kepler, we now know that each star in the sky has its own planets just like our sun. That is, in itself, a new and epoch-making discovery. What follows from this discovery is that we'll be spending a lot of time from now on staring hard at all those planets and doing all the hard science needed to understand them — and their possibilities for life. That means there are bound to be surprises, and we'll need to be prepared for them. One of those surprises might even, maybe, possibly, have something to do with other civilizations. So when you put it all together, it's probably time for us to get past what Wright calls "the giggle factor" when thinking about life — including intelligent life — on other worlds. And that brings us to another bit of SETI news. A year or so ago, the privately funded Breakthrough Initiative gave $100 million for doing serious, sober SETI science. That is really good news because the bottom line is things really are changing in our study of planets and life of all kinds. But it's not going to be like the movies. "I think people expect that the discovery of aliens is going go like it did in Contact, where the discovery of the signal and the confirmation of the signal happened in, like, a two-minute period," says Wright. So what Wright and Tarter are saying is: Please be patient. Real science is slow and steady. Doing it right will take our time, our dedication, our keenest skepticism and our sharpest intelligence. That's what it will take to answer one of humanity's oldest questions: Do other civilizations like our own exist on other worlds?